Unlike the ‘Kurgarten’ (Spa Garden), which was originally reserved for spa guests only, the ‘Rosarium’ was created for the local residents. Both guests and locals can enjoy over 130 types of rosea and about 10 000 rosebushes here. From early summer onwards, they offer an overwhelming view, which can best be enjoyed during a walk or from one of the cafés or ice cream parlours along the promenade. The ‘Rosarium’ also has a memorial for the discoverers of the ‘Rakoczy-Quelle’ (Rakoczy Spring) – Balthasar Neumann and Georg Anton Boxberger – as well as a large fantype fountain. 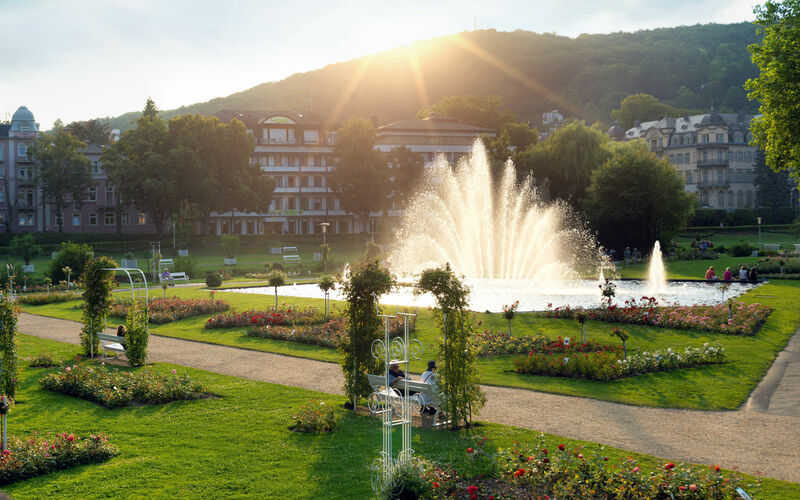 It is one of the most popular photographic motifs in Bad Kissingen – which has been awarded the title of ‘Rosenstadt’ (Town of Roses).